We understand that the doctors we work with desire and, quite frankly, count on our codiagnosis during recall visits, especially regarding restorative needs. In fact, patients will often turn to us, after the doctor has left the room and ask, "Do I really need that crown?" Using an dental intraoral camera, in my opinion, is the most expedient and effective way to help a patient visualize his or her problem and understand the treatment needs. 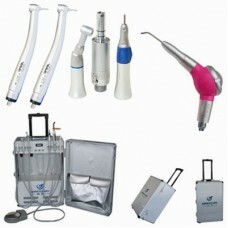 Over the last decade, I have evaluated and used many intraoral cameras. In Perio mode, the wavelength emitted by the LED curing lights highlights the different tissues represented by chromatic mapping. In other words, gingival inflammation will appear in shades of pink to deep magenta; new plaque will appear white and grainy, and old plaque in shades of yellow and orange. HYbands designs and creates headbands in a rainbow of colors, plaids, and prints for dental professionals. Founder Ashley Church started HYbands when she was in dental hygiene school; thus the name. After an overwhelmingly positive response, what started out as a dental hygiene fundraising project quickly turned into a business. In addition to creating a recognizable dental brand, HYbands provides a stylish and functional product. As a way to give back to the dental community, Ashley and her sister/partner, Natasha, have partnered with Smile Train, an international children's cleft lip and palate charity to fund a minimum of 20 cleft surgeries this year. Smile Train has a sustainable approach to a single, solvable problem: cleft lip and palate. Millions of children in developing countries with unrepaired clefts live in shame, but, more importantly, have difficulty eating, breathing, and speaking. Cleft surgery is simple, and the transformation is immediate. Smile Train's sustainable model provides training and funding to empower local doctors in 85-plus developing countries to provide 100% free cleft repair surgeries in their own communities. In addition to the headbands, be sure to check out HYsocks and medical bands. And remember, by purchasing HYproducts you are helping to improve the lives of children all over the world. As registered dental hygienists, we play an integral role in the diagnosis and treatment planning of both the restorative and periodontal needs of our patients. As health-care professionals, we recognize that patients value and trust our opinions and advice when it omes to their oral health care.